Canadian developer AgileBits has always positioned its 1Password password management software as a premium product, focusing on a combination of performance, portability, and ease of use to command a premium price and develop a significant following. Such continues to be the case with 1Password 4 for Mac (Mac App Store link), which the company released at the beginning of October. The new version of the popular app, however, enters a market that has changed significantly in the last 12 months, with numerous competitors contending for users, and even Apple entering the fray by implementing basic password management right into its operating systems. Faced with the increased competitive pressure, it would have been easy for AgileBits to focus on making 1Password cheaper, perhaps by moving to a “freemium” model that nickel-and-dimes its customers; or, in an attempt to justify the price, the company could have overloaded the app with a complete interface redesign and a bucketload of “advanced” features that complicate its use. Luckily, the company decided instead to stick with the basic infrastructure and build on top of it. As a result, the new 1Password feels familiar and allows existing users to transition from previous versions effortlessly. The new features—numerous and, in some cases, very useful—have been inserted into the existing workflows, making them easy to discover just by using the app. That’s not to say that everything looks the same; 1Password 4 has received a fresh coat of paint, and slicker graphics inside and out, including the ability to download professionally designed icons to represent various websites and software products for the items saved in the app’s database. Many interface elements have likewise been simplified and slightly repositioned to make the software easier to use and more modern looking. 1Password 4 underwent a complete redesign, but it maintains the familiar user interface of its predecessors, making the transition to the new version painless for users. Despite these changes, what really drives the updated version of the app is the knowledge that security is, at its core, a compromise between convenience and risk. Thus, every effort is made to ensure that your information is readily available when you need it, and that 1Password’s functionality integrates as transparently as possible with your workflow. This is perhaps best exemplified by the new 1Password mini, a compact view into your password vault that installs itself in the menu bar, from where you can access it even when the 1Password app isn’t running. It gives you access to all your saved credentials without your having to launch the main app, and it even allows you to “pin” a particular entry so that its window remains open and visible above everything else. Despite the fact that its bigger sibling launches quickly and doesn’t impose any significant performance hits, the “mini” panel is surprisingly useful. 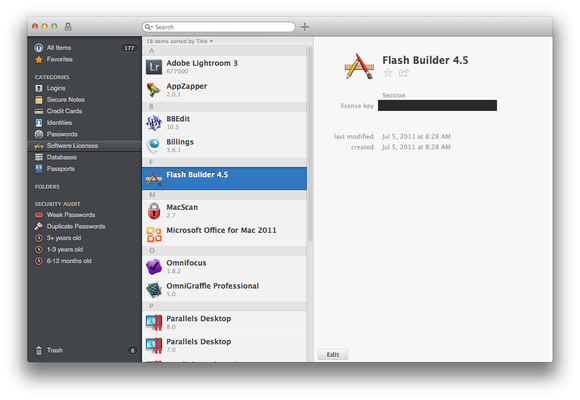 New in this version is also compatibility with a number of external launchers, like Running with Crayons’ Alfred, Objective Development’s LaunchBar, and perennial Mac favorite Quicksilver. Like its predecessor, 1Password 4 also comes with extensions for all the major browsers—Chrome, Safari, Firefox, and even Opera. The most significant changes affecting these components can be summarized in one word: louder. Once you install the extensions, for example, the browser components now use proper dialog boxes to ask you if you want to inject usernames and passwords in a webpage, generate a new password, or save and replace an existing one. 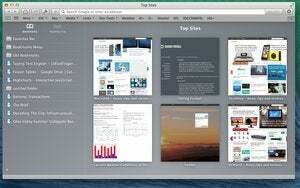 Unlike the tiny little panels that their predecessors used to add to the browser’s chrome, these windows are modal and cannot easily be ignored: You can either use them or close them, but you cannot fail to notice that they exist. When I encountered this new modus operandi, I instantly hated it; the idea of anything interposing itself in the normal flow of filling out a Web form and demanding my attention seemed like the antithesis of good usability. It didn’t take me long, however, to recognize the genius behind this implementation, because the flip side of demanding constant attention is that the app can more easily help you generate, save, and use the information you save in its vault. This is not just an abstract thought, by the way. I like to think that I’m fairly savvy when it comes to online security, but even after just a couple weeks of use, the number of passwords I’ve saved in my 1Password vault has jumped by a good 20 percent, and the vast majority of these are now of the strong variety, automatically generated by the app to provide good randomness and resistance to cracking. In fact, I’d venture to say that, when you combine the beefed-up browser extenstions with a significantly enhanced ability to fill in complex forms, this is by far the most significant change that AgileBits has introduced in its app, if perhaps not the flashiest. 1Password 4’s ‘mini’ menu companion is surprisingly useful. So far, I’ve spoken mostly about the app’s user interface, but some interesting changes also exist behind the scenes. 1Password’s security remains on a par with much of its competition’s: Vaults are encrypted using a fairly secure AES–256 algorithm, backed by a new tamper-detection mechanism based on digital signatures. The new version also supports multiple vaults, which means that you can more easily compartmentalize your saved data. This will please professionals who wish to keep information from different clients separate, or employees who want to ensure that they don’t mix personal and work data. Even better, vaults can be shared among multiple users, perfect for both family and business use. Another new feature that should help keep passworld data in good shape is a “password audit” that can detect weak logins or passwords that haven’t been changed in a long time. Unfortunately, you still have to change your passwords by hand—there is little that 1Password can do for you there, although AgileBits has at least improved its automated password engine by adding several new options, including the ability to use mixed-case letters when generating pronounceable passwords. Wi-Fi sync has finally made its way back to 1Password for Mac. If you dislike saving your personal data in the cloud—understandably, considering what governments have been up to of late—this means that you can now keep all your password data on a local network and still synchronize your vault across multiple devices. The App Store version of the app also supports syncing through iCloud, if you feel brave enough to trust that Apple’s black-hole-in-the-cloud service won’t suddenly decide to “disappear” your data into the ether. For my part, I’ve relied on Dropbox sync for years, and the service, which has never let me down, works as well as ever with the new 1Password. Your syncing needs, incidentally, are likely to dictate which version of the app you will want to purchase: Due to Apple’s own rules, you will be able to use iCloud only if you buy the software from the Mac App Store. 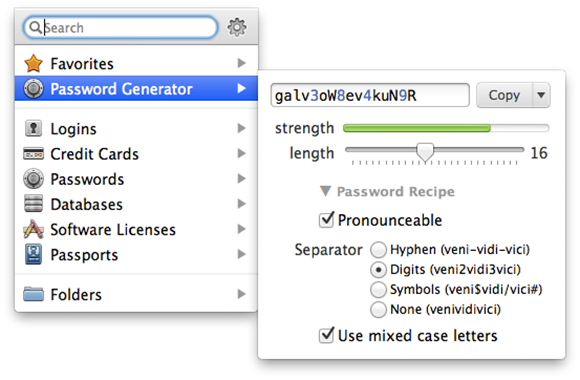 1Password’s generator offers many different options for creating credentials that are secure and easy to manage. And this brings us, finally, to pricing. 1Password 4 costs $40, or $56 for a family license. If you are an existing customer, there’s a good chance that you qualify for a free upgrade, which the company makes available to all App Store users and to other customers who purchased their copy of the software after the beginning of the year. For everyone else, the upgrade price is $35—temporarily reduced to $25 as part of the app’s launch. Frankly, I think that the folks at AgileBits are trying a little too hard to make everybody happy here, resulting in an upgrade scheme that is a little confusing. It’s always hard to judge a product solely by its price, and having multiple price points to contend with is only going to make it harder for prospective customers to decide whether they should invest in the app or not. As far as value is concerned, 1Password is a no-brainer. Sure, it’s an expensive product, particularly when you compare it with many of the other options out there. However, I’ve taken at least half a dozen password managers for a test-drive in the last 12 months, and 1Password is the only one that truly nails the right balance between security and convenience. There are a lot of password managers for the Mac, but 1Password 4 is the only one that provides the proper balance between security and convenience.